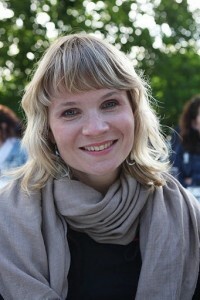 Anu Pennanen is a Finnish-born filmmaker and a visual artist based in Berlin. She began making short films in 2002 after working in the artist collective katastro.fi. Her film works explore themes such as globalization and standardization of urban models, architecture and its impact on the environment’s perception, temporalities of sites and the inscription of human lives in them. Lyrical and often sensorial, they show people marginalized economically, socially and politically, and transform in a subtle way their experiences through the use of fiction. Her films ‘A Monument for the Invisible (2003)’ and ‘Friendship (2006)’ received international recognition: Rotterdam and Hamburg Film Festivals, MOMA New York, CCA Glasgow, CAC Vilnius, Centre Pompidou Paris, Montehermoso Cultural Center Spain, Frankfurter Kunstverein, Manifesta 5 Donostia San Sebastián Spain. With the 5-screen film installation ‘Ruins of the Gaze’ (2010), she received the Golden Cube Award at Kassel Documentary Festival. Her work is in collections such as Kiasma Museum of Contemporary Art National Gallery, Finnish State Art Collection, Estonian Museum Of Contemporary Art and MAK Museum of Applied Art, Vienna, Austria. She also collaborates with writer and artist Stéphane Querrec. Their first fiction film, the medium feature length “Staande! Debout!” (Standing!) (2013), premiered at the Glasgow Film Festival before being screened at several venues in France, Finland and Belgium.